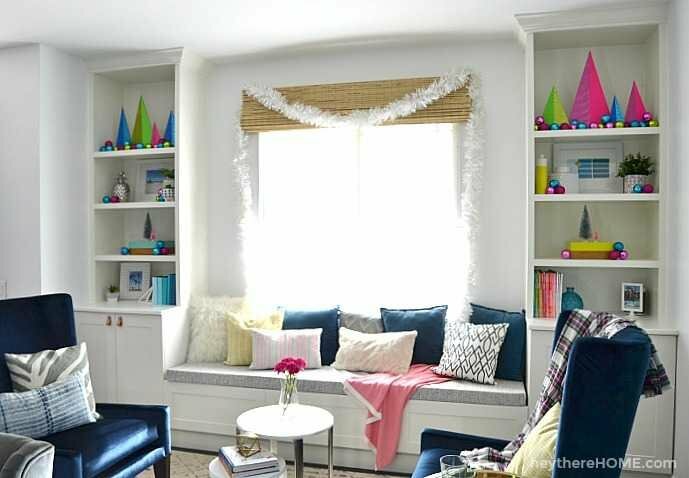 Inside: Less clutter means less stress! 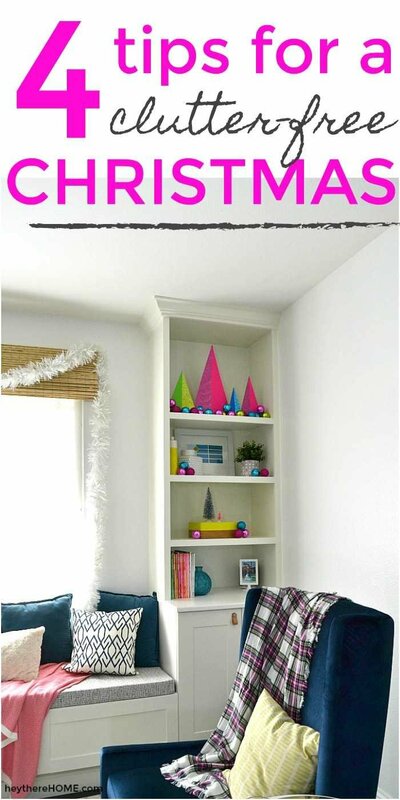 Enjoy the holidays with these 4 easy tips for a clutter free Christmas! I don’t always enjoy decorating for Christmas. I know, I know. It’s supposed to be “the most wonderful time of the year,” but all the “stuff” makes me feel really kinda anxious and cooped up. Usually I just overlook it knowing that the extra stuff filling the surfaces of my home is temporary. But this year when I was getting the Christmas decorations down from the attic, I decided to try something different. I decided to put out way less stuff! 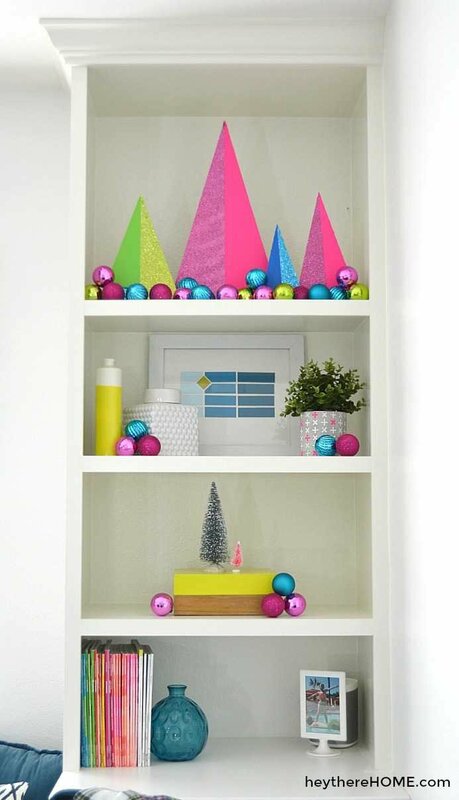 This had a bit of a snowball effect in the way I’m thinking about my Christmas decor. It’s given me so much more time and head space to actually enjoy the season without feeling like stuff is closing in around me. 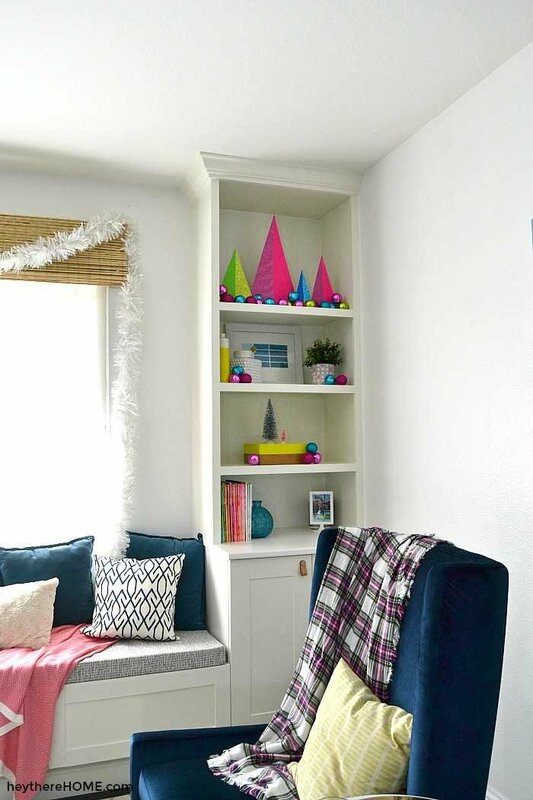 I know I can’t be the only one that feels this way, so I thought I’d share a few tips that are making this a much more clutter free time of year. 1 || Don’t put all your Christmas decor out. I know it’s tempting cause Christmas decor has a tendency to be sentimental. But that doesn’t mean that everything has to make it to display status every year. This year I probably put out only about 1/4 of the decor we have. 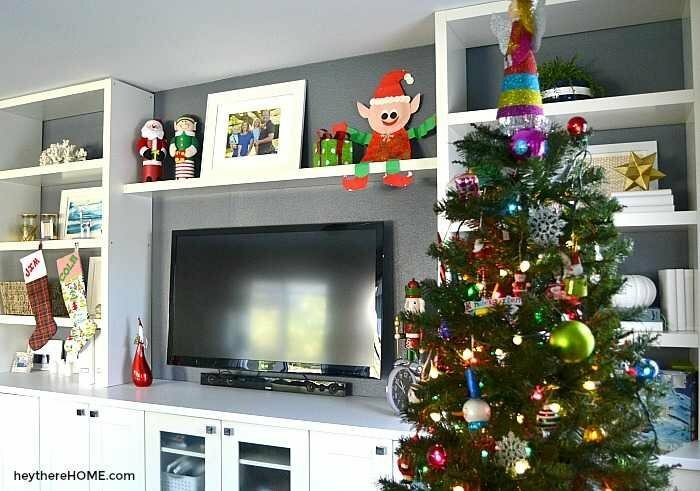 In years past I put almost everything out, added a new thing or two, and decorated most of the shelves around here with at least a few Christmas touches. 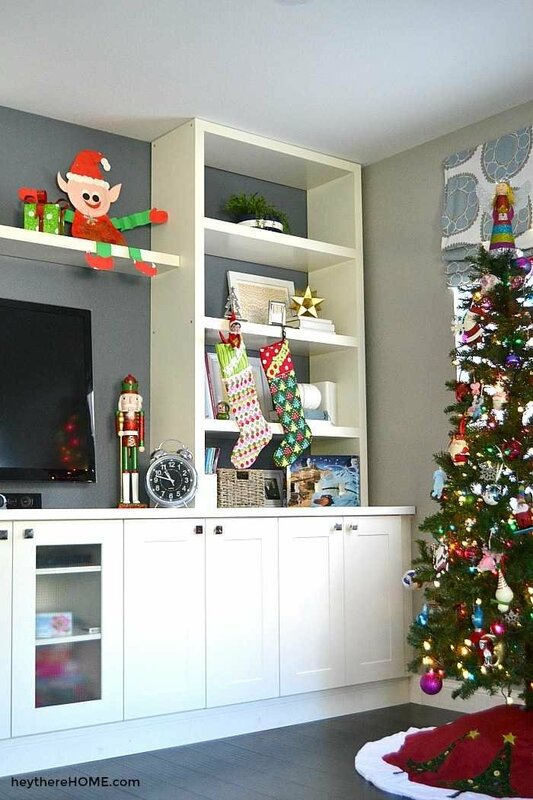 I started in our front room on my new built-ins and decided that I would pick one shelf to be very Christmasy and only put a few accents on the rest of the shelves. 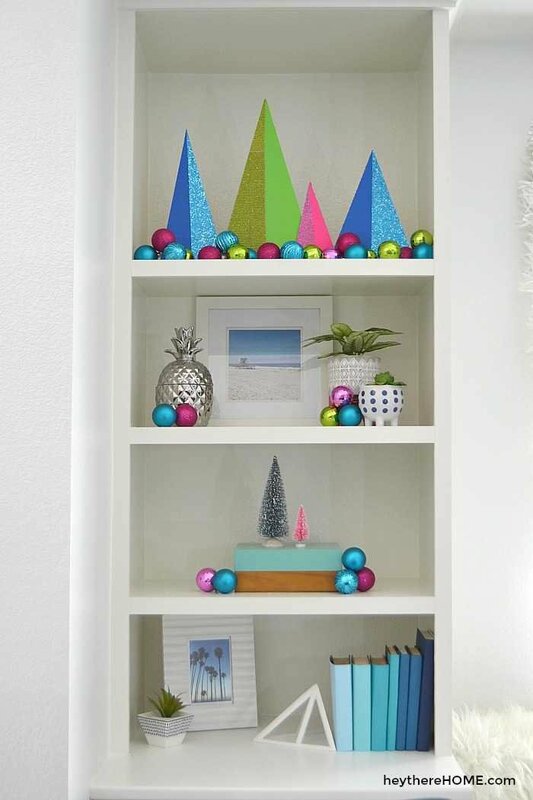 I filled the top shelf with my DIY Modern Christmas Trees — they’re cardboard — and filled the bottom with colorful ornaments. 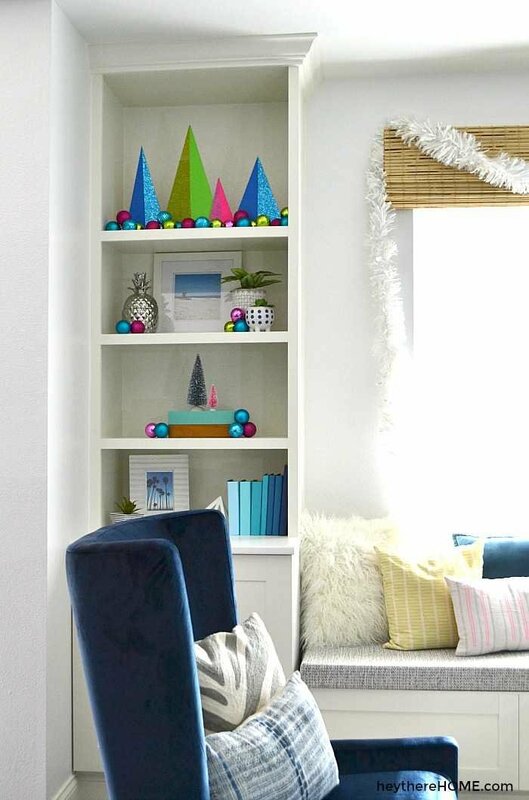 Then I sprinkled the colorful ornaments around the rest of the shelves and included a a few bottle brush trees a few shelves down. I did the same thing on the other side. I added a white garland over the window and that’s it. I keep the Christmas bins handy so that as I put Christmas decor out I can take my everyday decor down and store it in the Christmas bins. This makes it really easy to put my regular decor back up once the season is over. And putting everyday decor away makes it impossible for my surfaces to become too cluttered with stuff. And bonus: it let’s my Christmas decor be the star of the show! I love to put out decorations with my kids. They love to look through everything and we always end up reminiscing about past years or projects they’ve made. 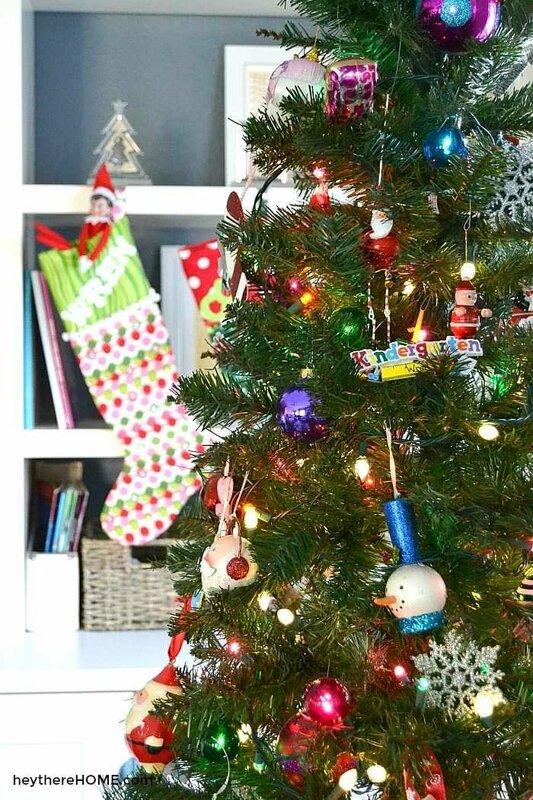 My little lady helped me with the front room that I’ll admit is my spot to decorate, but in our family room, where we spend the most time, I like it to be a bit more traditional and let the kids do some of the decorating, especially when it comes to decorating the tree. In years past our family room has been a bit over the top, and that’s what I was trying to avoid this year. So we spent time going through everything — the fun part, but then I had them each pick out a few of their absolute favorite decorations and we only displayed those. Again I took down what’s typically on the shelf to put up what they picked. They also each picked one Christmas craft that they’ve made for us to put up too. 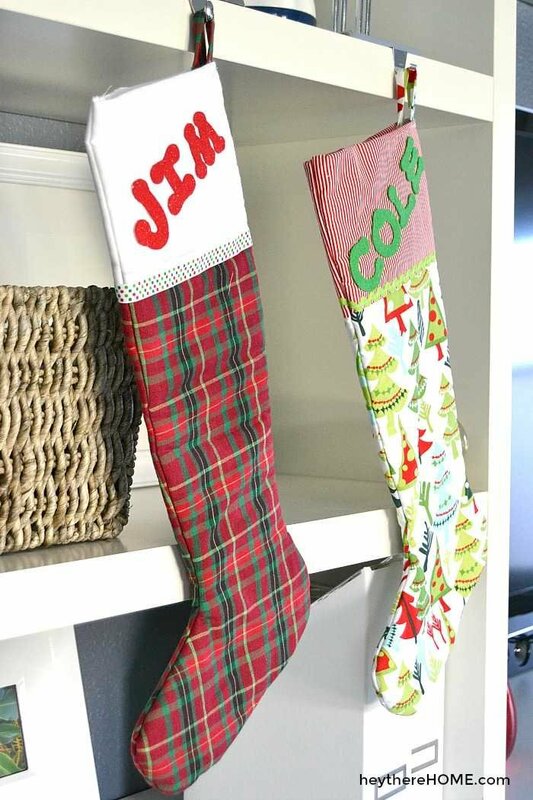 After that we hung our stockings — my absolute favorite decoration. And we spent a special evening decorating the tree. And yes the kids had free rein on putting the ornaments on. Again I kept a few of the less special ornaments out of the mix cause we have a lot. But I didn’t go and rearrange the ornaments at all once we were done. Yes that means that there are way more ornaments at the bottom, and yes they look a bit clumpy but it’s the way they did it and the memories made are way more important than the way it looks. —Something this type A had to get over. 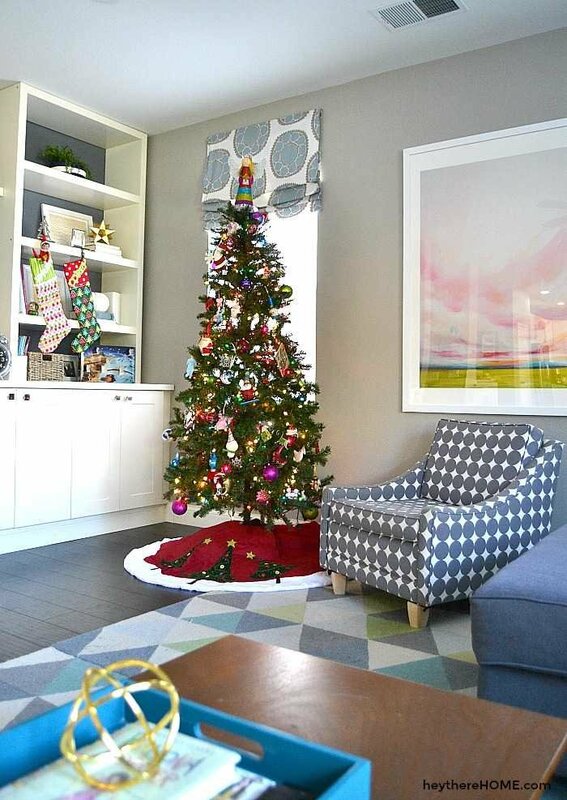 Just like your decor style, the way you decorate for Christmas is going to change and evolve over the years. I have a few decorations that haven’t made it out of the box for 2 years in a row — or more, so this year they’re being donated so that another family can enjoy them. I even have a few bigger decorations that I sold on Letgo and Craigslist. — A great way to fund new decor! I gotta say, this new approach to decorating for the holidays has me feeling much more comfortable in my home this season and that’s really what it’s all about right? —Doing what feels best for you and your family. I hope you’re finding ways to simplify this season and enjoying the moments with your favorite people, cause that’s certainly what matters most. High five to you, Esther! Isn’t it amazing how simplifying = less stress! Excellent! I tried this same thing this year. I’ve always been so stressed every holiday season and couldn’t figure out why. And, my house never looked like any of those featured on Pinterest house tours! I did it by choosing a color theme…blue and gold. That eliminated over half of the Christmas stuff right away. Then I decorated. It is beautiful in here! And, I’m not feeling any stress this year!